Next on The Scoop: Do Cats Get Lonely or Are They Fine Without Other Cats? Cat exercise is key in keeping kitties fit and at an appropriate weight. Think of cat exercise in terms of hunting, playing and simple movements. No one ever said losing weight is easy. 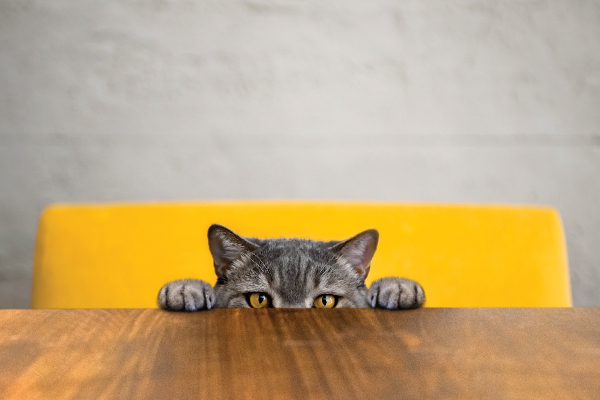 If it’s challenging to lose even a few pounds for people or for dogs, it’s even more challenging for cats, says Dr. Ernie Ward. “It’s physiological; dogs and humans use fatty acids, and cats use glycogens.” That’s where cat exercise comes into play. Sixty percent of cats in America are obese or overweight. Photography ©Erica Danger. Dr. Ward, who is the founder of the Association for Pet Obesity Prevention, says the problem is real. Sixty percent of cats in America are overweight or obese. This increases health risks for a wide variety of medical problems. What’s more, millions of cats only live to sit on the sofa and eat and, if lucky, use a litter box. And forget about any form of cat exercise — these cats even have difficultly grooming themselves. Current thinking is that obese cats may even suffer from depression. Dr. Ward says that humans get on a treadmill and at least start running longer distances to lose weight. And for dogs, we play fetch (maybe even for too long — but dogs keep going anyway because they want to please us and/or because they’re enjoying it). Playing into a cat’s hunting instincts will help a cat get exercise. Photography ©101cats | Getty Images. 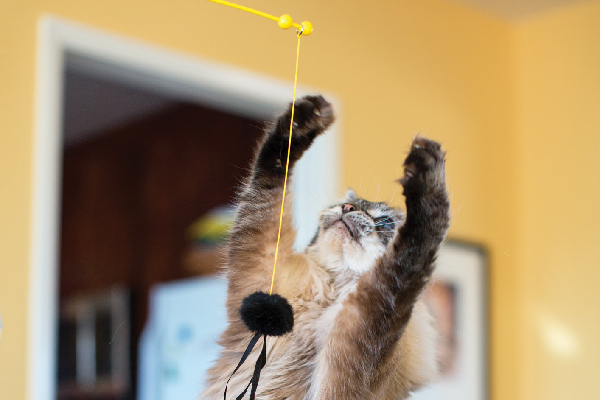 So, how can cats use movement to lose weight? Think of it as movement, not a workout, per se, but moving to hunt. Which is the reason how we feed cats is important. Also, given most cats’ preference, they don’t want to share food sources with others. “The way which we feed cats not only causes weight issues, we also unknowingly often create all kinds of behavior problems,” Dr. Bales says. Cats learn to “hunt” for their meals and naturally consume small quantities at a time. Searching for their meals activates their hardwired prey drive and offers a cat exercise (particularly when food is hidden at various levels, so the cat has to scamper onto a shelf or window ledge), as well as beneficial mental exercise. Dr. Bales created her own solution called The Indoor Hunting Cat Feeder. Devices resemble mice, and kibble is deposited inside. The idea is to use three of these feeders per cat, at first near the cat’s current bowl. Over time, spread the feeders out — with the goal to ultimately hide them. If you feed moist food, you can portion out food into small dishes and place those around the house in the same manner. 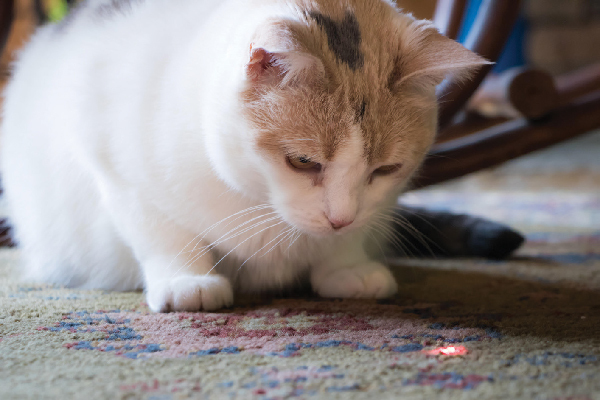 Games and toys like laser lights help cats exercise. Photography ©Joseph Jacobs | Alamy Stock Photo. Dr. Ward plays the laser light game with his cats. Of course, some obese cats will just look at the light and say, “So what?” “But even if you can start by enticing the cat to move toward the light, it’s a start,” Dr. Ward advises. The only challenge with the laser toy is that the cat never really gets a chance to catch anything, which must be frustrating. This is easy to resolve by ending the game with dropping a low-calorie treat, such as Bonito flakes, for the cat to “kill.” All cats are individuals, though most will express interest in an interactive toy — a fishing pole-type toy with feathers or fabric. Start with the cat batting at the end. Move to the cat following it. Then get the cat to chase it for 10 seconds. That’s all you need for some good cat exercise. Short bursts of energy is the goal. The good news is that there have never been so many cat toys on the market as there are today. Then again, for many cats, a wine cork or aluminum foil ball can make for great fun. Create tunnels for cats to move through. Sure, more svelte cats may run right through, but again it’s just a matter of adding more steps. Think of your cat’s exercise regimen as one step at a time. There are other advantages of interactive play: “You can see your cat is moving, and it builds the human-animal bond,” Dr. Ward explains. Make sure your cat is active around the house. Photography ©krblokhin | Getty Images. It’s the same idea as you counting your daily steps. 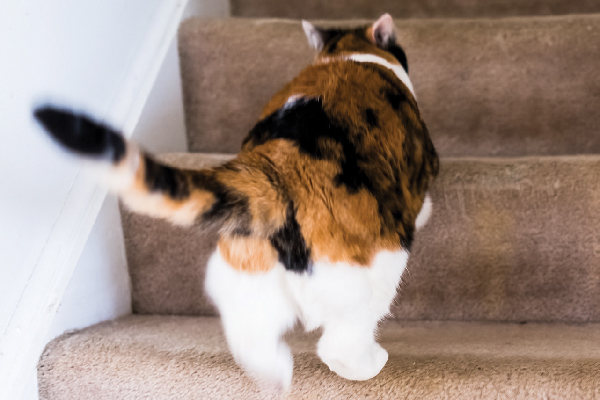 If you live in a multi-level home, encourage your cat to go upstairs and downstairs multiple times daily. Encourage your cat to follow you as you do housework. When you get off the sofa, take your cat off your lap and place him down in another room, forcing him to simply walk back to where he was. With appropriate adjustments in diet and increased movement, the goal is to drop ounces. You may not even notice there’s a change before a pound, and then another pound, eventually falls off. Slow and steady is best. A cat’s diet is another major factor in keeping cats fit. Photography ©Casey Elise Photography. For cats, following veterinary direction for appropriate diet is the first step to losing weight. Dr. Elizabeth Bales says to have realistic expectations and understand that the cat didn’t grow to be 18 pounds overnight. So, losing weight should take awhile. While crash diets aren’t a good idea for people or for dogs, it’s a horrible idea and potentially life-threatening for cats. “The result is cannibalizing the cats’ own liver,” Dr. Ward says. 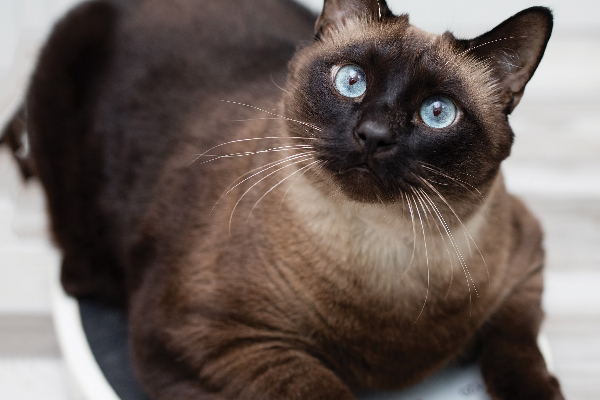 Hepatic lipidosis is a potentially fatal condition that occurs when cats stop eating, forcing the liver’s function to be severely compromised. 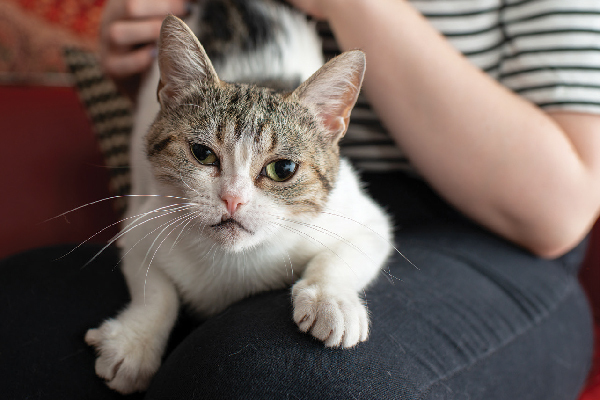 The American Association of Feline Practitioners recently released a document called “How to Feed a Cat: Addressing Behavioral Needs,” which is available free at catfriendly.com. Thumbnail: Photography ©Mark Rogers Photography.